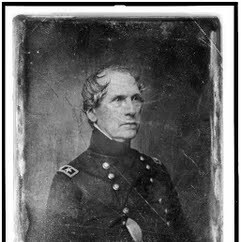 John Ellis Wool was an officer in the United States Army during three consecutive U.S. wars: the War of 1812, the Mexican-American War and the American Civil War. By the time of the Mexican-American War, he was widely considered one of the most capable officers in the army and a superb organizer. He was one of the four general officers of the United States Army in 1861, and was the one who had the most Civil War service. When the war began, Wool, age 77 and a brigadier general for 20 years, commanded the Department of the East. He was the oldest general on either side of the war.